Drive this 2,350-piece model into position with the 8-wheel steering, rotate the superstructure and activate the power functions motor to extend the outriggers, lower the feet and raise the crane arm up to 75cm into the air. LEGO model number: 42009: Get ready for the biggest, most complex LEGO Technic model ever! This authentic 2-in-1 model also features 10 wheels, 5 axles and a detailed V8 motor with moving pistons. It also rebuilds into a container stacker and truck featuring an extending and raising boom. Batteries required: 6 x AA (not included). For ages 10 years and over; EAN: 5702014975606. WARNING(S): Not suitable for children under 3 years old. To be used under the direct supervision of an adult. Get ready for the biggest, most complex LEGO Technic model ever – the Mobile Crane MK II! Drive this 2,350-piece behemoth of a model into position with the cool 8-wheel steering and rotate the superstructure. Then activate the included LEGO Power Functions motor to extend the outriggers, lower the feet and extend or raise the crane arm up to 75cm into the air. Lower the hook with the working winch and get ready to lift the load! This authentic 2-in-1 model also features 10 wheels, 5 axles and a detailed V8 motor with moving pistons. Rebuilds into a container stacker and truck featuring Power Functions motor-powered extending and raising boom.Requires 6 x AA batteries (not included). 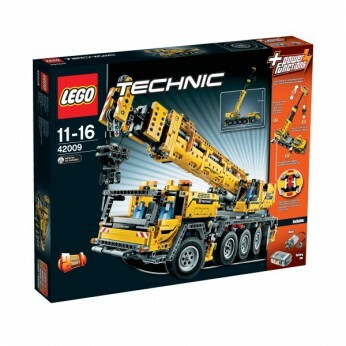 This toy costs approximately £149.99 (for the latest and best prices make sure you check our retailer list for the LEGO Technic Mobile Crane MK II 42009 above). In our review of LEGO Technic Mobile Crane MK II 42009 we classed it as being suitable for ages 6 years, 7 years, 8 years, 9 years, over 10 years but recommend you check the manufacturer specific advice before purchasing.